does temp. 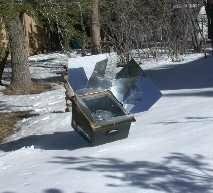 affect solar cooking? im wondering if temp. affects solar cooking? can you guys help me? Thank you for your question Justin. I assume you are referring to outside temperatures, such as in the winter time? If you have a well built and insulated solar cooker it can be freezing cold outside, but if the day is bright and sunny you can still reach temperatures of 350 F and more. The outside temperatures affect your solar cooking very little, if any, if you have a good solar cooker. I use my solar cookers in the winter all of the time.